Well good morrow my low sodium friends. I hope you have all had a pleasant holiday season so far filled with low sodium treats and at least one or two fruit cakes. So sit tight. After the clock strikes midnight on the 31st, Sodium Girl will be back with daily interweb musings, bringing you shiny new recipes, tips, tricks, and advice to make your 2010 healthy and delicious. In the meantime, I thought I’d say a quick hello and dedicate this post (much needed after a lovely holiday respite) to something light and fresh (much needed after a heavy holiday gorge-fest). 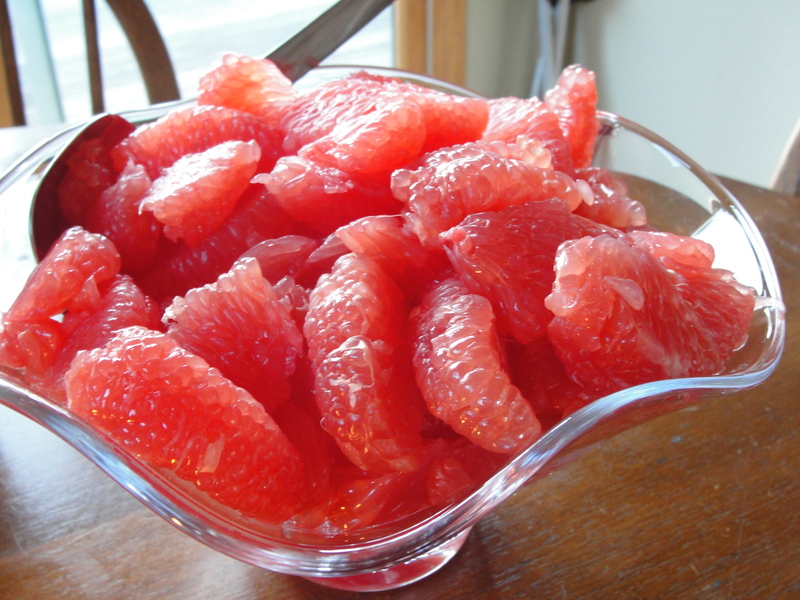 Feast your eyes on the lovely grapefruit, delicately segmented for easy Christmas morning eating. Amongst the many lessons I’ve learned through living on a low sodium diet, one of the greatest has been to appreciate food in its purest form. And this particular grapefruit was a perfect example of the simple pleasure of naked food. It was sweet, sour, and satisfying on its own – a wonderfully bright palette cleanser – memorable without a dollop of yogurt or even a sprinkling of sugar. I mean, just look at those plump juice pods, just ready to burst in your mouth. I will admit it, before my kidneys failed I was an over-salter. Without even tasting my food, I would sprinkle the white stuff all over my plate, pretty much addicted to the taste of those little crystals. What I didn’t realize was that in my eager shaker shaking, I was not enhancing the taste of my meals but masking their natural flavors. Steak, green beans, pasta – all of it was becoming a one note of salt and I was actually limiting the potential range of flavors I could experience. It was only when I was forced to eliminate the extra accoutrement that my taste buds were reawakened to the range of sweet, sour, spice, and umami that can exist in each bite of food, on its own. It does take some time for your taste buds to adjust, so be patient. But soon, flavors will become brighter until steamed kale reminds you of candy and the peppery notes in arugula tickle your tongue. Think I’m talking crazy talk? Well look at it this way. Some professional eaters (aka very lucky people) close their eyes to enhance the experience of eating, blindfolding themselves from any other distractions. Now imagine eating food without the distraction of dressings, sauces, and spices. The intensity of taste is heightened even more. Suddenly a bowl of bald grapefruit bursts all on its own. Not to say that dressings, sauces, and spices aren’t good. I try to make as many of those (in low sodium versions) as possible. I’m just saying, it is good practice to have food in its original form once in a while to really appreciate its full potential. That way, when you do dress it up, you know the exact qualities you want to enhance. So your homework this week is to enjoy a stalk of broccoli, a freshly sliced pepper, or even a nibble of dark chocolate without anything but your senses. Go ahead. Get intimate with your food and chow on. Happy New Year and bravo on such an impressive blog. Great, concise content. Your photographs are really very impressive. Do you know about free range stock? No, nothing to do with low sodium stock – just great photographs. I use their photos in my examiner.com column. Happy New Year to you too. Thank you for your kind comments. These are actually my own photographs – I recently bought a Sony Cyber-shot to help enhance the “professionalism” of the site. Heidi Swanson’s “101 Cookbooks” also has some great advice on food photography. I try to take most of my shots in the afternoon when the daylight is good. I really enjoyed looking at your blog as well! All the best. I am definitely going to experiment with much less salt come the new year and begin to learn to appreciate the “honest” flavor of each food. I recently cooked artichokes with no salt in the water and guess what? The artichokes tasted wonderful! Live and learn.